I can't believe it's been almost a month since I posted to my blog, I needed a break I have been super busy and also updating my website. It's very old and needs to be gone through. It was hot here yesterday but the weather man insures us that good weather is coming this weekend. We are thinking of going to Apple Hill in Camino California. We will see how I feel. I have not been feeling the greatest. 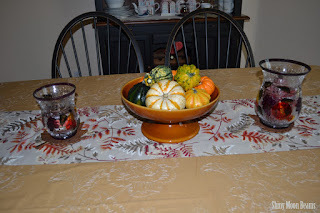 I decorated my table for fall, I see now I left the tablecloth on it from when the kids came to dinner, to bad because I love to see the gorgeous wood on it. This is all the decorating I am going to do for Fall this year, I think! we will see. LOL! 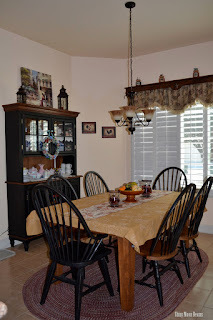 Recently Kirsten and the kids came to dinner and here is just a few photos we had her step daughter Kayla take. We took some of them as well. With Rylan crawling everywhere and the kids talking constantly I was going crazy! 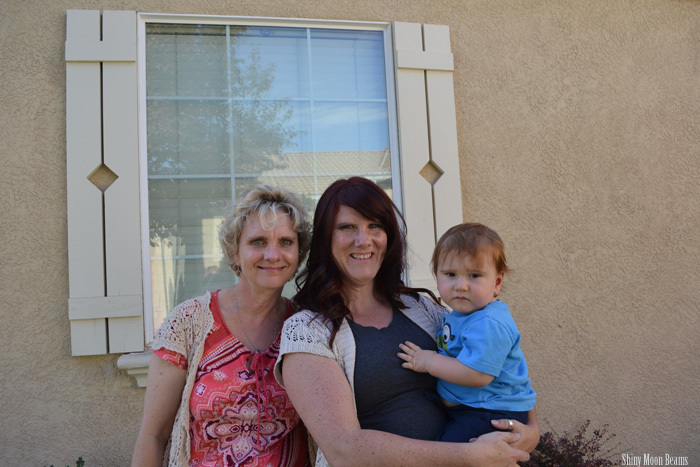 I am not used to that after having just one granddaughter before Kirsten married Glenn and she became a step mommy then had her own. It's all good though, I just have to take it slow and steady. Steve and I are going to try Indian food this weekend we've never eaten it before. 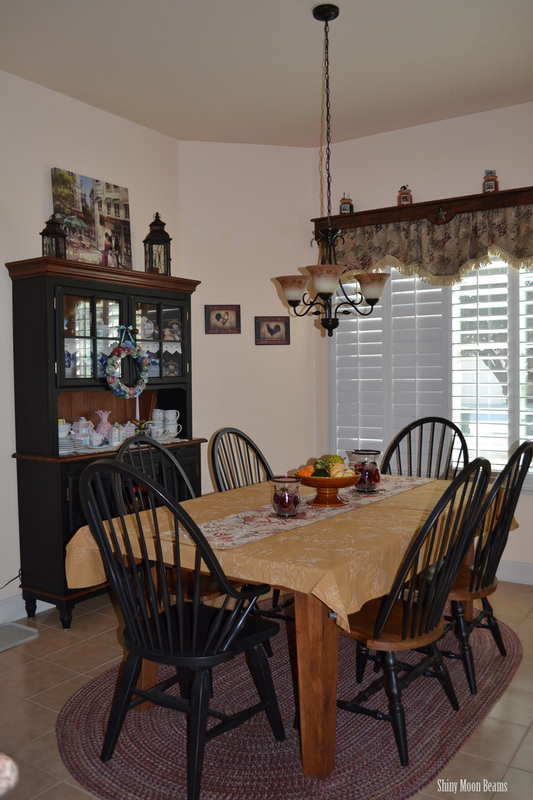 pretty decorating, I have never had indian food either you will have to let us know what you think.... your grandson is too cute! Hi there! Your Fall decorations look wonderful and festive :) I saw you are following my blog - thanks so much! I am now following you back! Have a great week! Such a pretty baby! Babies are very active and a lot of work! 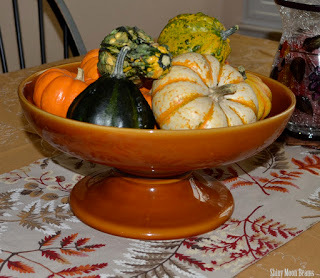 Love your table and that bowl with the gourds is so nice for Fall!! I hope you are feeling much much better. I didn't know you were blogging again until I followed a link from Susan's blog....nice. Wow, your grandson is growing up so quickly, it seems no time since he was born. He looks a lot like his mommy and I'm sure you are thoroughly enjoying having another sweet grandchild to love on. I hope you soon feel much better. It's no fun feeling under the weather. Enjoy the rest of your week as much as you are able. I haven't decorated for fall. Tom put up a few Halloween things, but I seem to have lost interest. We are still very unsettled here. After 2 years one would think that we had a direction to go...still no luck. Rylan is so cute. I love the color of his hair. Again, I hope you are feeling better. Hi Kat! It was so nice to see your tag at my blog. I just came back to blogland this past Monday. I have missed it & missed the friends I have made through blogging. I have thought of you so often! Rylan is so cute! It would be a big adjustment to go from one grandchild to 4 now. I can get where you are coming from, because when Avery comes each week, it's like having 3 more added! :) She is a real livewire. Hope you are feeling better, & up to going on your trip. Sending you big hugs! Hi Kat! Yes, Ryan just turned 5 last week and Jacob was 3 in September. I know what you mean about all the craziness with kids and with Rylan walking... that's always a handful keeping them out of things and from getting hurt. Did you have Indian food? We like chicken curry with all the trimmings- chutney, coconut, raisins, peanuts. Enjoy the weekend!